This non-rebounding, rubber hammer virtually eliminates bounce back, making this a very worker-friendly tool. Its high-quality construction includes a completely welded metal frame and rubber bumpers. The extremely durable rubber faces allow for a powerful strike yet will not leave marks. These faces can be replaced when worn out, make this an extremely long lasting tool. This is a professional grade rubber hammer that is perfect in situations where you need to hit something hard but you do not necessarily want to damage it. 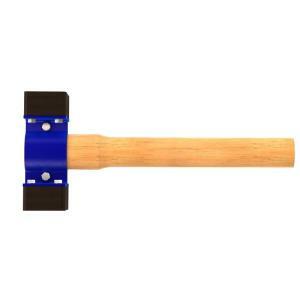 Tbook.com crawls the web to find the best prices and availability on Hammers and related Tools and Hardware products like Bon Tool 7-3/4 inch x 2-3/4 inch Rubber Hammer with 18 inch Wood Handle. For this page, related items include products we find that match the following keywords: "Hammer" at our vendor partner Home Depot. Bon Tool 7-3/4 inch x 2-3/4 inch Rubber Hammer with 18 inch Wood Handle is one of 151 Hammers and related products listed in the Tools and Hardware section of Tbook.com If you have any questions on this product, please give us a call at 734-971-1210 during the hours of 9am - 5pm EST for assistance. Thank you for shopping at Tbook.com, the Internet Department Store!